Chichibu Distillery started producing its famous whiskies in 2008. The distillery is owned by Venture Whisky Ltd., established by Ichiro Akuto in 2004 in Chichibu, a city in Japan’s Saitama Prefecture, about 100 kilometres from Tokyo. Ichiro Akuto was born into a family with a long brewing tradition, they had started sake brewing in Chichibu around 1625. To this day the natural environment, seasonal characteristics and the high quality of the water provide perfect conditions for distilleries. Chichibu distillery is usually not open to the public but provides individual tours for professionals. Although still quite young, the Chichibu Distillery already ranks high among whisky aficionados. The great success of the “Ichiro’s Malt” brand is built on a stock of 400 casks filled with exceptional single malts of various finishing and colouring. These casks were the last remains of the Hanyu Distillery, Akuto’s family business, which had to close down due to financial dire straits. Based on the Hanyu Whisky stock and the newly distilled “Ichiro’s Malt” at Chichibu Distillery, Akuto started building his brand by creating three pure malts: “Mizunara Wood Reserve”, “Wine Wood Reserve” and “Double Distilleries”, an exceptional whisky based on blending malts from the old Hanyu Distillery and the new Chichibu Distillery. In addition, there are single malts blended and bottled in limited series. "The First", "The Floor Malted", "The Peated" and, from 2015, “On the Way”, matured in Bourbon and Mizunara casks, featuring also some of the original Chichibu whisky. At Chichibu Distillery, people believe in natural processes, natural colour and non chill filtering to produce a very pure whisky. Each year they produce about 90,000 litres of the precious spirits. About one third of the production is shipped to international markets, mostly to the United Kingdom, to France and to Taiwan. Once they hit the stores, Chichibu whiskies are usually sold out within days and therefor hard to find for the occasional buyer. The market shows great demand and Chichibu would like to follow suit – but not at the expense of quality. The company’s defined goal is to keep its very special place in the market by continuing to produce whiskies with very special characters. And this will require a slow and well balanced growth, which eventually will also include expanding local barley production. This way the Chichibu Distillery will have better access to high quality resources needed for its high quality whiskies. Each year, Chichibu Distillery processes more than 150 tonnes of malted barley, for the most part imported from England, Scotland and a smaller amount from Germany. About ten to 15 percent of the barley needed today is grown by local farmers, a venture Ichiro Akuto would like to advance in the future, in order to produce an increasingly genuine Japanese whisky. Chichibu runs peated malt only for about a quarter of the year, three quarters are reserved for unpeated whisky production. From the inspection table, where the malt is thoroughly checked for quality, it is sent up to the malt mill via a transport duct. The mill at Chichibu runs with four steel rollers. To achieve a consistent quality of the milled malt, which is also called grist, the distance between the steel rolls can be adjusted to the wide range of climate conditions due to the distinct local seasons. The grist then goes off to the mash tun, where it simmers in hot water for the starches to convert to sugar for fermentation. Made from stainless steel with a wooden lid the mash tun can hold 2,400 litres, but is only filled with 2,000 litres for not to overspill. Chichibu runs three cycles in its mash tuns, separating and reusing the third wash for the next first wash, which eventually will enhance the mash’s sugar content. From the tun, the mash is passed through a heat exchanger down to the fermentation tanks. Chichibu has eight of these impressive washbacks, all made of a very special (and expensive) wood: quercus mongolica or Japanese Oak, which gives a special flavour to the Chichibu whiskies. Fermentation takes about four days, well enhanced by the Mizunara material, which supports a stable lactose fermentation, supplying the fruity flavour unique for the Chichibu whiskies. 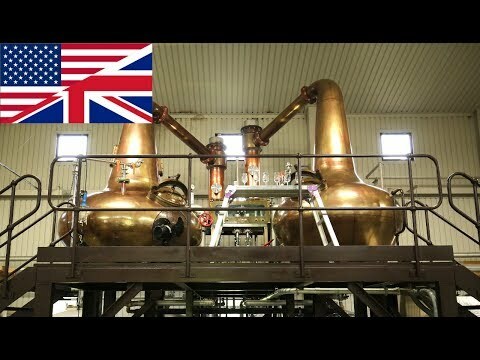 Chichibu Distillery’s two pear shaped copper pot stills were manufactured by Forsyth in Elgin, Scotland. Each still holds about 2,000 litres and has no constricting pieces or reflux bowls. The distillate goes straight into the condenser, then passes through downwards angled lyne arms of only medium length. Both these processing features contribute to a heavy flavour the experts at Chichibu’s are looking for. Next the distillate arrives at the spirit safe. Here it is separated into pot ale and and low wines. From here the low wines go to the spirit still, which produces the flavour of the whisky. At the spirit still, the hearts of the distillate are separated from the heads and the tails. At Chichibu’s, the distillers are tasting the distillate already at this point. That may be unusual, but this way they make sure they get the flavour they want to achieve in the end. Chichibu Distillery owns four dunnage warehouses and is preparing to open a fifth in order to store an ever growing number of casks, as of today there are more than 4,000 of them. Dunnage warehouses are built in a very special way. with walls of natural stone or bricks, earthen floors and slated roofs. They also have rather low ceilings, accommodating only three or four stories of barrels stacked right above each other. All these features help to keep temperatures low, and the climate moist and damp – ideal for slowly maturing whisky. This is a quite cost intensive process, plus the barrels have to be moved by hand. Since Chichibu Distillery produces a variety of whisky styles, it also uses a great diversity of casks. Most whiskies mature in bourbon barrels, but there are also rum barrels, sherry casks, wine casks, port casks, tequila casks, grappa casks and not to forget the new oak casks made from Mizunara also called Japanese Oak, or American Oak, French Oak….and others. And of course Venture Whisky always keeps pursuing research in order to find out, which kind of cask might serve a given whisky line the best. Preparing sales and shipment, Chichibu Distillery also does its own bottling and labelling. The bottling line allows for different bottles and different labels for different destinations in different countries. Ichiro Akuto’s was born into a family that brewed sake for more than 300 years. in 1945 his grandfather decided to start distilling whisky as well. His son, Akuto’s father, continued the Hanyu Distillery until Japan’s economy experienced hard times towards the end of the century. Sake was not on top of the shopping lists back then and the family had to sell the sake business as well as the Hanyu Distillery. The buyer back then wasn’t interested in the 400 casks of whisky that were left, but Akuto wasn’t about to let the treasure go to waste with the closing of Hanyu. He grabbed his chance and the 400 casks and in 2004 established Venture Whisky Ltd. Chichibu Distillery started producing in 2008. Chichibu’s first label was the legendary “Card” series, pretty much sold out right away, somehow setting the pace for all Chichibu whiskies to come. Around the world they are usually sold out only a few days after they arrive in the stores. Share your experience with other whisky lovers. Write a note about your trip to the Chichibu distillery.